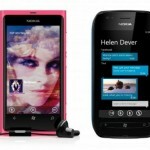 Great news from Nokia, Nokia Announced that they will brings updates with several new features to All the existing Nokia Lumia Windows Phone (Nokia Lumia 900,800,710,610). Nokia is committed to continue to support and brings update to existing Nokia Lumia and are definitely not being left behind.
" The current Lumia range of smartphones will continue to be supported by Nokia with a new updated user interface, new features, apps and upgrades." " The rollout of these updates for the Lumia 610, Lumia 710, Lumia 800 and Lumia 900 smartphones will be phased, and we will share more details closer to the start of delivery."